Since Fly Rod & Reel’s demise I’ve been working on freelance projects and generally keeping busier than I’d like to be. In June I decided to help North 40 Outfitters with their media efforts and part of that equation is to take over editor duties for the North 40 e-magazines. 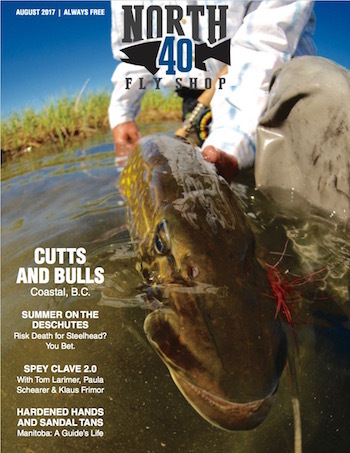 I am slowly taking over assigning and acquiring manuscripts and images for these publications, and the first little peek at what’s to come just went live on North 40′s Fly Shop home page, in the form of North 40 Fly’s summer issue (click here to read). I did not assign these pieces, but I did work through some edits, and bumped a few pieces to the fall issue so that we have time to get those articles and images to the right level. So, here’s a look at the summer issue and a heads-up that the fall issue should follow in October. Keep an eye out for that one (you won’t be disappointed). I’ll also offer a reminder when it’s live, via Angler’s Tonic. And don’t forget to tell me what you like/don’t like about the summer issue. I’m excited about this opportunity to be creative and lead the North 40 team on their mission to provide the best content on the Pacific Northwest and beyond. And in the end, what all of you want is what I want to provide, so don’t be shy. I do want to hear from you. This entry was posted in Industry, Northwest and tagged Deschutes steelhead, how to spey cast, Manitoba pike, North 40 fly Shop, North 40 Outfitters, Spey fishing tips. Bookmark the permalink.